Our Fab Fash Life: Our Weekend Getaway to Virginia!! Nothing like a relaxing weekend full of fabulousness, it's always a MUST to just get away and recharge, there's no better place to do so than Virginia. We arrived on Friday afternoon and left on Sunday evening, that way we were able to enjoy the whole weekend. 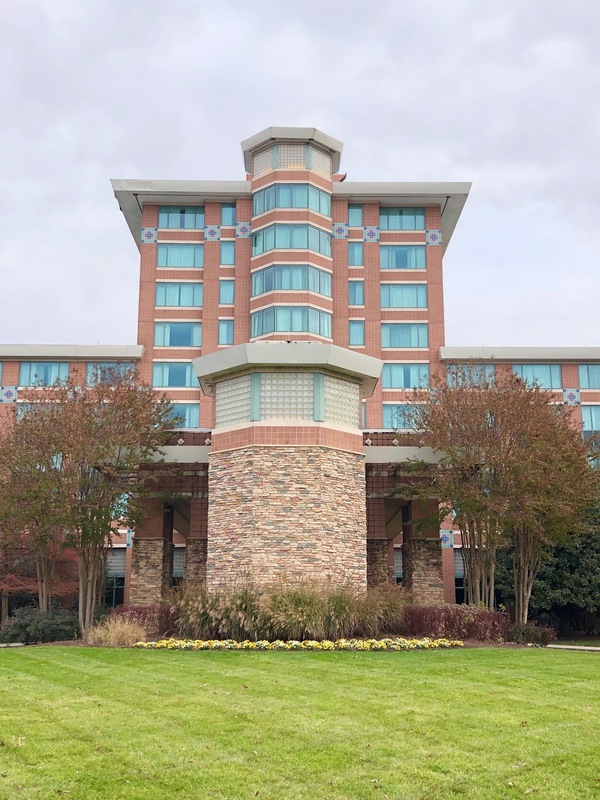 We stayed at Lansdowne Resort & Spa, located on Woodbridge Parkway in Leesburg. We chose Lansdowne because of their amazing pet friendly atmosphere, obviously you know we took Piper along so it was important that they welcomed her as well. If you let them know at the front desk that you have a pup joining you they will bring you a pet bed, bowls ect, they even have a pet area called Bark Park for the pups to enjoy some time outdoors. The rooms are spacious, bright and clean, not to mention the beds are super comfy. I really think Piper enjoyed the decor, as you can see she made sure she checked out every single bit of it...lol! She ate up all of the attention she got from the friendly staff, they were there to help with whatever we needed. The hotel sat on a huge property with a beautiful golf course, indoor and outdoor swimming pools, a huge fire pit for s'mores, a spa, a gym, restaurants, stores and much much more. We spent most of the first evening wandering around exploring everything on the property. When our stomachs started growling we began searching for a great dinner spot. I found a local restaurant called Lightfoot, it was about 15 minutes from the hotel. As usual we had no idea where to eat so I took to google to see what was good. I'm so glad we discovered Lightfoot because the food was absolutely amazing. I ordered the short rib and Rob ordered the filet mignon. Let's just put it this way, we were both linking our fingers when we were done. Everything looked beautiful, was cooked to perfection and full of flavor, I even had the pleasure of meeting the owner/cook who was more than amazing. She makes sure each plate that comes out is just how it should be and that really says something. We enjoyed the food so much that we went back for brunch on the following Sunday which was just as spectacular. Lightfoot is located on N.King Street in Leesburg, the next time you are in the area for dinner or brunch I recommend them 200%, you are going to LOVE the food. By the time we got back to the hotel we were more than stuffed and ready for some rest, and boy did we get it. Both Rob, Piper and I slept soundly and comfortably all night until 7am when we woke to start the day. 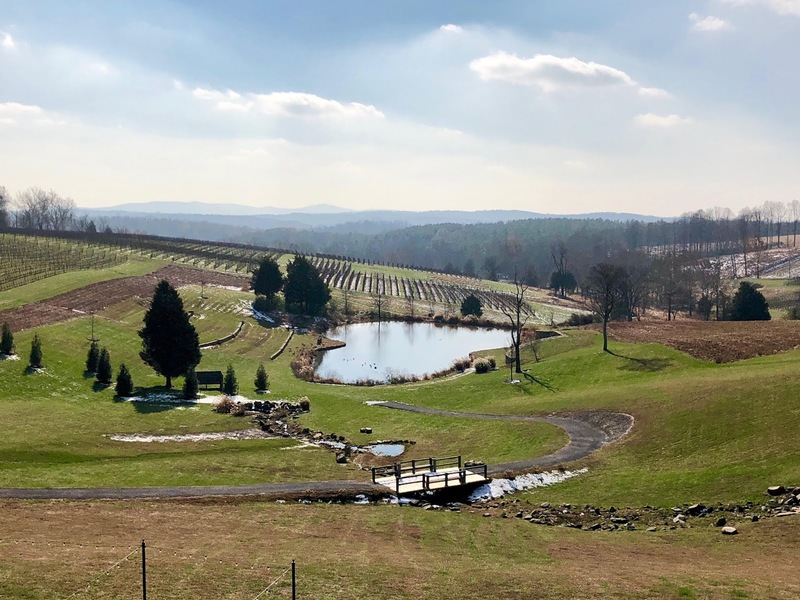 We had a day planned out at Stone Tower Winery which is only a 15-20 minute drive from the hotel, it's located just atop of Hogback Mountain in a stunning location. The view was amazing as you can see from the pictures below, we couldn't enjoy the outdoors like we wanted due to the cold weather so we definitely plan to go back in the summer months. We took part in a tasting tour that was so insightful and fun, we got the 411 from Kevin Chung aka @TheWineProfessor check him out on Instagram. He can answer just about any question you have when it comes to wine, I know Rob and I asked him a ton while we were with him. 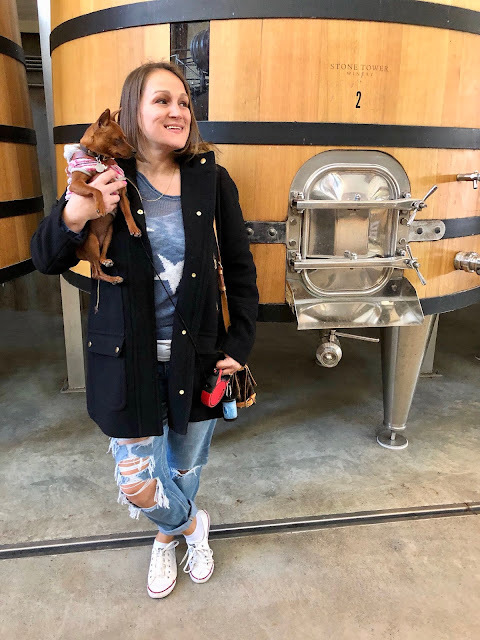 He walked us through the entire facility, showed us some of their 75 acres of vines, the barrel rooms, and shared some really spectaular bottles with us. Everything was clean and well taken care, and wow was it packed with people. They have a variety of nibbles in the Harvest Barn like local and imported cheeses, fresh chibatta, crackers, and artisan chocolate. On Friday evenings and all day Saturday and Sunday they have wood-fired pizza. and last but certainly not least there is the gelato, yassssss I said gelato. I got myself a mint chocolate chip gelato and a hot cup of cocoa. I almost forgot to tell you guys, Stone Tower has a wine club that offers a ton of "members only" discounts, events, tastings and much much more. Check out their website (Stone Tower Website) for more info, the clubhouse has thee best laid back feel with a cozy ambiance. I'm a bit bummed they aren't closer because I would definitely be visiting on a regular basis, we really enjoyed our time at Stone Tower. As you can see Piper more than enjoyed it as well, she always loves exploring new places, she's the most curious soul you will ever meet. When it was time to leave Stone Tower we were more than exhausted, so the bed back at Lansdowne was calling our names. We stopped at DC Prime for dinner on our way back to the hotel, they have thee best french onion soup. For a main course I ordered the roasted chicken, and Rob the salmon, kinda backwards to order everything but steak at a steakhouse. That's us though, always a bit off...lol! Before we knew it Sunday morning crept up on us and it was time to start heading home, all in all it was great weekend that I recommend 100%. It's the best way to slow down and recharge, plus Virginians are so sweet and friendly. As I told you guys we stopped back into Lightfoot for brunch before we headed back home to Baltimore. The whole trip went smoothly thanks to Mitsubishi Motors, we got a beautiful new 2018 Mitsubishi Outlander. Recenetly we've been car shopping because this year we plan to get a new car, what better way to test one out than take it on a road trip for the weekend. It handled beautifully and wow was it comfortable, we are more than considering the Outlander. It has a sleek body style and plenty of room inside, so all of my camera equipment and luggage fit perfectly. 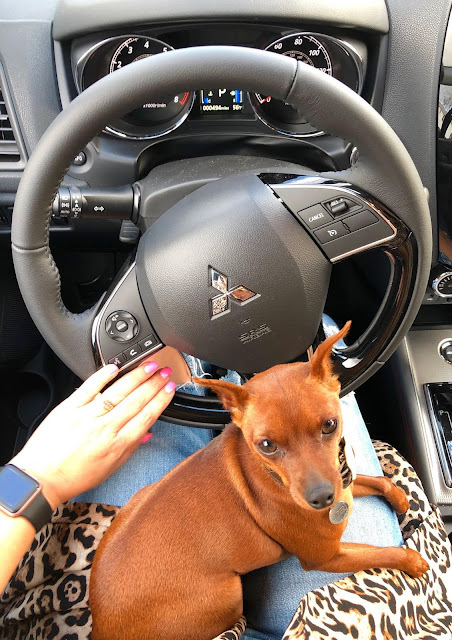 it just made the whole trip that much more enjoyable, even Piper took to the idea of a new car, she was more than comfy riding shotgun..lol!! I definitely feel us becoming a Mitsubishi family very very soon. I hope you enjoyed our little weekend road trip, I would love to hear about any great spots you have been too. We're always looking for fun new places to visit and explore, so your recommendations will be more than welcomed. I hope you guys have a wonderful holiday!! I tried to subscribe to subscribe to your YouTube page using this link in the entry form: https://www.facebook.com/myfabfashlife.com, but it says this page is not available. I have done everything else asked on the entry form. Please let me know at tracysdeloach@gmail.com if I need to use a different address. I don't want to be disqualifed by not entering all. Thanks. This looks like an amazing hotel, and that you each enjoyed yourselves very much, including the baby of the family. Also, some of the entries in the giveaway don't work. I have been searching for them individually. They’re fixed hun, the links were still in the info tho!! This looks so incredible. I am not sure if I have ever been or stayed in Virginia, if I did, I would remember if it looks like this. I love where you stayed - Lansdowne Resort & Spa, located on Woodbridge Parkway in Leesburg. I will have to find out where Leesburg is - we have a town with the same name in Florida. Thanks for sharing! Sounds (and looks) like a lovely place to spend some time relaxing. Looks nice and your dog is so cute. I love your pup so cute, looks like you had so much fun. Beautiful Min Pin. Thanks for posting. How do I heart a post on Pinterest. I can't find the heart anymore. I noticed after an update a while back that I no longer saw it. same with me I can't figure out how to heart it. I have a question. Sometimes I subscribe to something and my email AUTOmatically puts something in spam box. I go through and then mark not spam. When it automatically puts something into spam box does that show up as a BAD mark on you and spam? No as long as you don’t physically Mark it spam it will not. There is a way that you can market that particular email so that it does not automatically go into your spam box. Why cant it be internationally? If the payment method is paypal. I am new to much of this Social Media stuff. I hope that my entries were complete. I look forward to reading your Blogs and learning how this world revolves. Best of luck to you in 2019 and beyond! I Love Virginia! Have been through Virginia many of times on way to go see son and grand daughter in NC! Its a great place to visit! I Love Texas. I'm A Trump Supporter. My Family and Me Need Spending Money. Summerville, SC.... The hotels are a lot cheaper than Charleston and you can see the sites of Charleston with a 20 minute drive. Hello can you explain your entry form for the holiday cash? I have finished alot of the task as far as following thumbs up on other days but it says I only have 4 entries but really I should have 30+ or even more? Wow What an incredible weekend getaway!! Haha your puppy is super cute! I can't believe how pet friendly and accomadating your sty was wow! Virginia sounds like a pretty fantastic place and so scenic and beautiful! !Thumbs up! I'm not sure if you are aware, but Facebook only allows 5000 individual page/site likes per person, at this time. So in order to like y'all on facebook I'll have to UNLIKE as many of my current pages LIKED by me NOW. Tell Facebook to NOT limit Individual Page Like to 5000! Thanks! What a lovely Vacation! I hope I win! I love your dog it is so adorable. The winery looks awesome and I would love to see it in person. I bet you all had a great time there. This looks like such a wonderful getaway! Beautiful place, wine, food!! What a beautiful place for a weekend getaway and the food looked amazing! Love the car too. Glad to read your post and that you had a wonderful time. What a fun weekend! I am originally from Virginia--transplanted to Texas...but I so miss my beautiful home state! its fun.. any can give me money im so for please sent me money of this skrill acount christianloydtenaflor@yahoo.com please help any donors please..